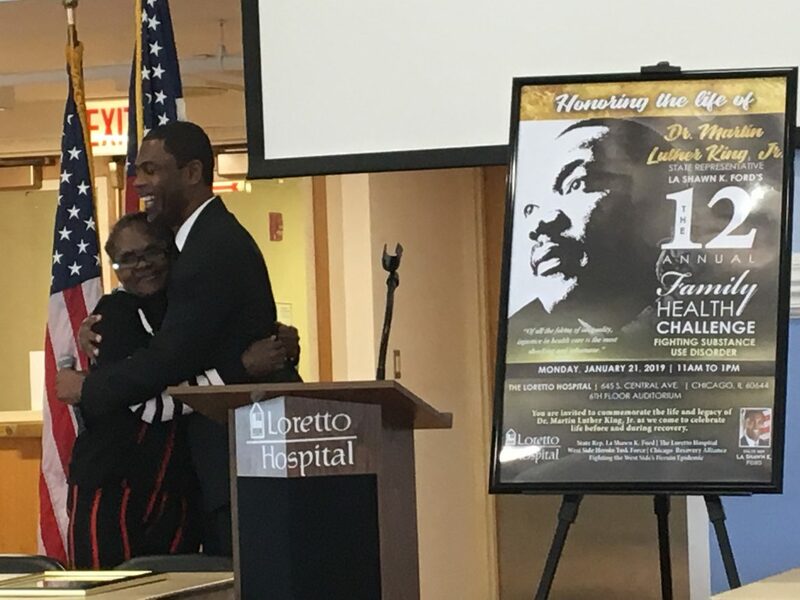 State Rep. La Shawn Ford hugs his mother at an event held Monday at The Loretto Hospital to honor Dr. Martin Luther King Jr.
One speaker talked about his uncle, whose spiral into addiction led him to steal the family’s Christmas presents – twice. Another speaker introduced his elderly mother, who has struggled with substance abuse for years and is now in treatment. The purpose of Monday’s event held at The Loretto Hospital was to commemorate Dr. Martin Luther King Jr. It was the 12th annual event organized by state Rep. La Shawn Ford but the first that focused on fighting drug addiction. “This year we changed it up” from healthy living to substance abuse, said Ford, who’s running for mayor. Ford brought his mother to the front of the room. “For her to be here is really good,” he said, explaining that she has suffered several overdoses. One place where West Siders can get help for their drug addiction is Loretto Hospital, which has a 16-bed rehab program as well as a 28-bed stabilization/detox unit. The PCC Wellness Center also offers substance abuse treatment at its chemical dependency clinic in Oak Park. Austin is at the epicenter of opiate addiction, some of Monday’s speakers noted. Dr. Thomas Huggett, director of mobile health at Lawndale Christian Health Center, showed a map detailing overdose deaths in Chicago, with the most dots on the West and South sides of the city. The death rate on the West Side is three times the Chicago rate and seven times the Illinois rate, Huggett said. He’s been involved in the West Side Heroin Task Force, which has worked to get the word out about naloxone and medication-assisted treatment (MAT). “There’s lots of evidence that MAT treatment works and saves lives,” Huggett said. Last year, the Chicago Recovery Alliance distributed about 100,000 doses of naloxone. Iliana Espinosa-Ravi, an outreach specialist with Chicago Recovery Alliance, held up a package containing naloxone, or narcan as some know it. The drug is injected into a person’s arm, leg or behind if they’ve lost consciousness from an overdose. Anyone can administer the drug, and it has saved many lives, Espinosa-Ravi said. Espinosa-Ravi said Illinois law allows her to carry hundreds of doses of the medicine without a prescription, and her organization distribute it at gatherings like Monday’s event. Huggett said naloxone also comes in a nasal spray, which is generally covered by insurance; it’s more expensive than the injection. Someone does not have to be diagnosed with an addiction to get the drug, and most pharmacies will give naloxone to someone without a prescription, he added. The most vulnerable groups for opioid overdose are people experiencing homelessness, those who have been in prison, anyone entering or exiting treatment, and those living with HIV or AIDS. But anyone can fall victim to substance abuse, Espinosa-Ravi said, adding society must stop stigmatizing people with an addiction.